A new manager, however, will not be one of said changes. 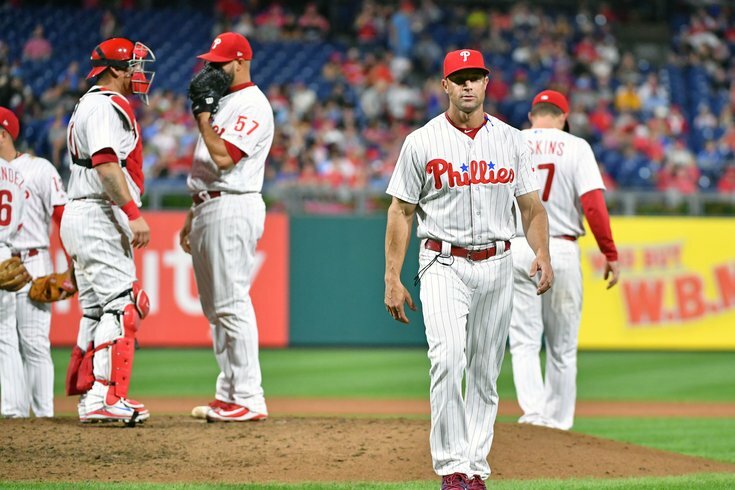 The Philadelphia Phillies 2018 season came to an unceremonious end on Sunday as Gabe Kapler's first season at the helm finished with a meaningless win over the Braves to get to 80-82 on the season. What was once a promising season filled with playoff hopes and a possible National League MVP candidate in Aaron Nola quickly went south in early August when the team began a 17-34 slide that would send them from 15 games over .500 to two games below that mark — a mark many thought would be a sign of ample progress after finishing 16 games under .500 a year ago. Now, the Phillies head into an important offseason full of free agent possibilities with seemingly more questions than answers. That's the main theme of today's Phillies season finale edition of What They're Saying — where do they go from here? And just how much do they need to change to that next step in 2019, a playoff berth? Will Kapler change his ways? General manager Matt Klentak saved us all from a ton of drama by announcing before the season was even over that first-year manager Gabe Kapler would be back next season. And while Kapler seems like the kind of guy who is open to change and new ideas, it will be interesting to see if he applies that outside-the-box thinking to self evaluation. Don't expect Kapler to change his core philosophies this season, but if he thinks there aren't a few areas in which he can improve, than that's a greater problem than any of his on-field decision making (see: Kelly, Chip). Kapler's Phillies did, in fact, make a 14-game improvement over last season and only three teams in baseball – the Braves (plus-18), Oakland (plus-22) and Boston (plus-15) – had a more substantial jump in total victories. Unlike those other three teams, the Phillies will be watching this postseason just as they have watched the previous six. And unlike those other teams, the Phillies had an epic freefall over the course of the season's final eight weeks, posting a 17-34 record in their last 51 games after being 15 games over .500 through Aug. 5. In order to find a Phillies team that played that poorly over its final 51 games, you have to go back to Terry Francona's 2000 team, which also went 17-34. Francona was fired on the season's final day and, of course, went on to what has been a likely Hall of Fame managerial career. This collapse happened “because” of a lot of things, but Kapler’s reliance on analytics to make in-game decisions overshadows them all. The people that hate the “analytics” he represents want to use him as a cautionary tale, chortling pompously as though baseball hasn’t changed since the invention of the curveball. An over reliance on anything will get you killed in a 162-game season, because nothing works every time. A lot of the time, it felt like Kapler was trying to outsmart baseball. He lost. There is a lot to say about Kapler. He has his supporters. He has more critics. He slows the game down, he over-manages, he overthinks, and it is perfectly reasonable to assert that there are several losses that happened this year because of his actions. Screwing up Milner’s entry into the game remains a moment that deserves to be laughed at in its absurdity and lack of precedence. If you muddle a simple in-game act, flummoxing umpires and letting the baseball world laugh at you on the third day of a long season, it colors the perception of whatever happens next. But it’s a long season, and Gabe Kapler’s Phillies weren’t a bad team for most of it. Just one that operated in ways we hadn’t seen before. Regardless of how you felt about him, Kapler set the tone early: Whether you’re transitioning to a new manager, figuring out a new roster, or trying to call in Hoby Milner from the bullpen, making a change can be difficult. Many of the questions surrounding the Phillies this offseason will have to be answered by Matt Klentak. And according to Jim Salisbury, he's not going to make any rash decisions this offseason out of fear over his job security. Klentak is levelheaded and operates with a calm exterior. But he is too smart not to know the clock is ticking on him. He sees the reflection of those empty blue seats. He knows how badly owner John Middleton wants to win. He knows that his biggest decision to date as Phillies GM, the hiring of Gabe Kapler as manager, remains the source of much skepticism locally and throughout the game. But Klentak remains resolute — and ready for a most important offseason. He has promised changes and they will go beyond free-agent additions, though adding a Bryce Harper, a Manny Machado or a Patrick Corbin would overshadow anything else. The most important question is likely going to be about free agency, and Todd Zolecki thinks a big signing is one of the quickest (and possibly only) ways this team can change fan perception. For every action, there's an equal and opposite reaction. So if the Phillies do indeed land a big-name free agent or two this winter, what does that mean for the rest of the guys on the team? Adding outfielder Bryce Harper or infielder Manny Machado would probably cost more than $40 million per season, but would fill a need and put some fans in the empty blue seats at Citizens Bank Park. "I am certainly not saying that we are not flawed, by any stretch," Kapler said. "We are a team that needs to improve. We need to improve from every possible angle." Regardless if Harper lands here, the Phillies need to move on from Herrera, which means they'd have to eat some of the $24.5 million remaining on his contract. I've seen enough. It's time. Corey Seidman — and his NBC Sports Philadelphia colleague Jim Salisbury — also both believe that Herrera could be playing for another team next season. But Seidman also believes this could be the end for two of the longest-tenured position players on the roster. Herrera, Cesar Hernandez and Maikel Franco could all be gone this offseason. The Phillies essentially spelled the impending end of Hernandez's tenure here when they signed Scott Kingery to a long-term contract. It is doubtful the Phillies enter 2019 with Kingery as the everyday shortstop. His arm probably isn't suited for third base, and second is his natural position. Can only keep so many infielders.